(Bloomberg) -- North Korean leader Kim Jong Un urged a “severe blow” to those imposing sanctions on his country and told his ruling party to push “self-reliance,” signaling his determination to hold the line in talks with U.S. President Donald Trump. Kim told Workers’ Party of Korea officials Wednesday that the country should strike at those who thought they could make North Korea surrender through sanctions, without elaborating, the state-run Korean Central News Agency reported Thursday. 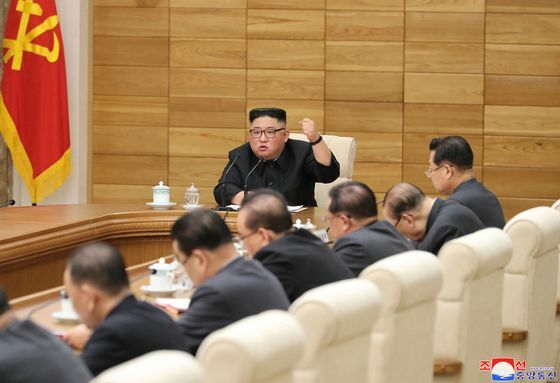 “By continuing to advance the socialist construction with the self-relying economy that fits the conditions and circumstances of our country and that is based on our power, technologies and resources, we should deal a severe blow to hostile forces who mistakenly believe that they can make us surrender with sanctions,” KCNA quoted Kim as saying. The comments came before members of North Korea’s newly elected rubber-stamp parliament hold their first meeting Thursday, an event that will be closely watched for clues about changes in economic policy or power structures in the secretive state. Some analysts speculate Kim may officially be designated head of state during the session, allowing him to represent North Korea constitutionally and in diplomatic settings. His grandfather and state founder Kim Il Sung was posthumously named North Korea’s eternal president, and its current figurative head of state is 91-year-old party cadre Kim Yong Nam, who holds the title of President of the Presidium of the Supreme People’s Assembly. Kim’s remarks did not necessarily imply that North Korea is preparing a military strike, said Go Myong-Hyun, a research fellow at the Asan Institute for Policy Studies in Seoul. “We should see it as a figure of speech,” Go said, as Kim attempts to ward off sanctions pressure. The session comes as Trump prepares to host South Korean President Moon Jae-in at the White House on Thursday. Moon, who has tried to bring the North Korean and U.S. leaders together, is trying to rescue nuclear talks thrown into doubt after Trump walked out of a Feb. 28 summit with Kim in Hanoi. North Korea has been pressing for relief from the sanctions choking its anemic economy, while the U.S. said Kim’s regime was unwilling to offer enough significant disarmament steps to warrant that kind of reward. The allies want to discourage Kim from any actions that could provoke Trump and return the two sides to the familiar cycle of threats and counter-threats. North Korea is planning to celebrate the birth of its founder Monday, an occasion that the regime has sometimes marked with shows of military might.